It's something of a tradition for an older sibling to receive a gift "from" their new baby sibling upon the birth. I suppose the rite was started as a way for the parents to make the big brother or sister feel special amid all the hullabaloo over the baby, and perhaps a new toy would help keep the older child occupied in those first days as the parents readjusted to the "getting by on 2 hours of sleep" routine. I also like to think the gift is something of an olive branch extended by the parents on behalf of the baby to the older sibling; a way of communicating for the baby in rudimentary toddler-ese, "Look, kid, I am giving you this awesome new toy so please don't kill me in my sleep even though I am about to destroy life as you know it." Harper has developed something of a thing for penguins of late. It started with his enjoyment of watching the daily penguin feeding at the California Academy of Sciences, and was launched into mild obsession status by his love for the book 365 Penguins, which he would insist we (specifically, the ever-so-patient Byrne) read each time we visited our neighborhood bookstore. So, the baby will be giving him his own copy of the book as well as this pudgy little handknit penguin (I admit, I helped a bit with the knitting part). My hope is that 1) He'll love the gift, and perhaps even his baby sister as well, and 2) He won't immediately request 364 more penguins (this is a distinct possibility, as he is a lover of both large numbers and consistency). 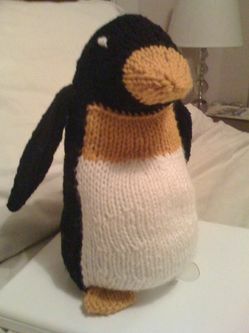 The pattern came from the Winter 2004 issue of Knitty, but I first spotted it in a Hail Mary search on Ravelry for a knit penguin patttern. It was an easy and quick knit that I was able to complete in leisurely spurts over a couple of weekends, and it just may have hooked me on knitting plush animals--I like that all the parts are worked separately and then seamed and stuffed, making these types of projects easy to pick up and put down as needed. I would have liked to use a more smushy, soft, and natural fiber, but I had a big skein of cheapo black acrylic yarn left over from some long-ago learning-to-crochet project, so I picked up some cheapo off white and gold to match and got going. In the end, I am thrilled with the results, and now the toy is imminently washable, a fact I am sure I will praise when Harper's sister ruins his life yet again by spitting up all over his (hopefully) beloved handknit penguin. P.S. : Please forgive the substandad photo, taken with my phone. I finished knitting this in a bit of late-pregnancy nesting panic, and it immediately went into my hospital bag, which immediately went into the back of the car to await the onset of labor. Ducks--or penguins as they were--must all be in a row at this point, lest I go a little more crazy. My boys return home tonight, after their weekend away! I have an amazing mother and mothers-in-law and am supported, encouraged, and loved by such a wonderful network of women--all of whom I celebrate today. 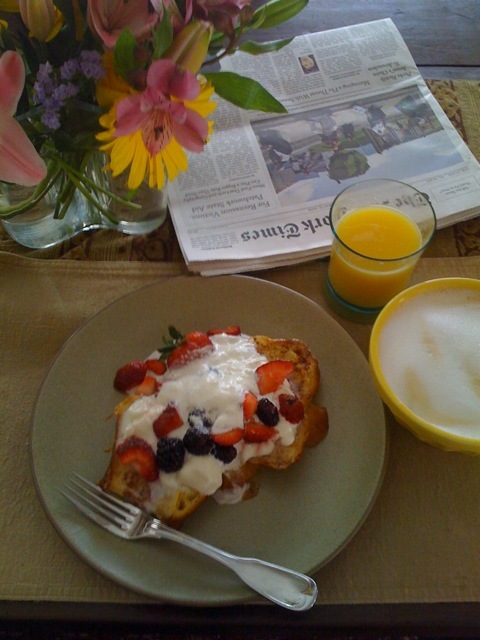 I have generous and loving neighbors, who knew I was alone today and delivered a plate of homemade challah French toast topped with fresh berries and whipped cream, and a mimosa with just enough Champagne. Almost as much as the delicious food, I appreciated the sight of a pajama-ed, morning-haired little one--something I was missing this morning. I got to read a good chunk of the Sunday Times undisturbed over breakfast, and I have plans to read the rest of it this afternoon. Perfect, warm farmer's market weather. A jam-packed staycation for me that included lunches and dinners out with friends, shopping, a much-needed pedicure, a long walk, reading, knitting, a massage, yoga, crafting, hanging out in the garden, couch napping, and in-bed laptop movie-watching, plus plenty of time to do a major clean-out of the pantry and bathroom cupboards and catch up on bills and paperwork. The perfect combination of resting and nesting! This weekend, Byrne took Harper to Austin for a visit and I decided to stay home to do some resting and nesting and enjoy some much-needed quiet alone time before Little Miss Reese comes waltzing into our lives. What do I have planned? A whole lotta nothin'. Seriously. I have nothing against socializing, and there certainly are some friends I'd like to reconnect with this weekend if the opportunity arises. But a big part of this break for me is the liberation from a schedule for the first time in the last three years of my life. Spontaneity has been on a hiatus around here, and I am just now realizing how much I've really missed it. I'm out of practice. An already-emerging theme of this weekend has been re-learning how to slow down. At lunch today, I found myself initially fidgety. When my food arrived, my first instinct was to dive in and eat quickly. Part of that was due to the fact that I had been fasting since the night before for a blood draw, and I was ravenous. But also, I have become so accustomed to eating quickly while simultaneously taking care of someone else's needs. So I set my fork down, took a breath, sipped my drink, leaned back in my chair, and pulled out a book. I accepted a refill on my iced tea. When the waitress tried to clear my plate prematurely, I politely asked her to leave it so I could nibble some more. After lunch, I decided to browse the bookstore down the street. Again, I found myself rushing, quickly searching through my mental files for any books I've been meaning to check out. It took a few minutes of feeling mildly frantic before I realized: I don't need to be anywhere else right now. No one is hungry or tired or bored or asking to go home or to the park. I can linger. And linger I did, so long that I didn't realize my watch had stopped ticking and my parking meter was expired. Oops. Or was my ignorance to the passage of time all part of the lesson of these few precious days? My boys are off on an adventure together, and I am here alone, enjoying the quiet thrill that comes with relearning simple ways of being happy and free. So far, it has been the best Mother's Day gift I never knew I wanted. 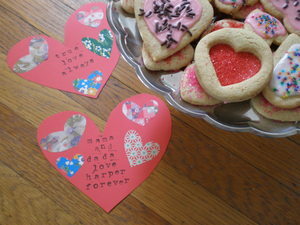 May your day be sweet and filled with the kind of romance and treats that can only come straight from the heart. 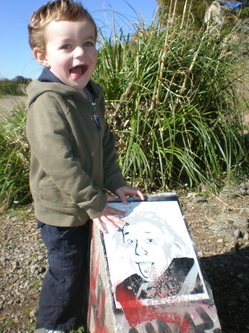 We don't know 'bout no bowl, but it was a definitely a super Sunday for a long walk/treasure hunt at the Albany Bulb.